"In the game, the player must complete missions by controlling toys (usually in the form of vehicles). These missions take place in rooms of a house. The game is known for its unique tasks themed around the various household areas. For instance, the first mission, which takes place in the kitchen, involves using a toy car to roll eggs over to a pot of boiling water. The game has five basic types of playable vehicles: race cars, which were primarily used in racing missions (though some missions would have the player navigating mazes in race cars), armed ground vehicles such as tanks or trucks with rocket launchers, airplanes, helicopters, and transport vehicles (which are always unarmed, but would typically be used to transport various smaller toys). A battle mode is also available in the game for up to four players. 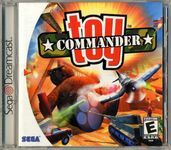 Source: Wikipedia, "Toy_Commander," available under the CC-BY-SA License.